No More Heroes is an interesting game with an intriguing storyline and presentation, but ultimately suffers from repetitive gameplay, yet still remains enjoyable throughout. From the creative (or crazy) mind of Suda51, the creator of Killer 7, comes No More Heroes, a game featuring a lightsaber-wielding teenager killing everyone in his path in order to become the greatest assassin in the fictional down of Santa Destroy. You play as Travis Touchdown, an otaku who enjoys playing video games, watching old wrestling tapes, and also watching some adult-oriented videos. Upon winning a "beam katana" (see: lightsaber) off an internet auction website (see: ebay), you are contacted by an organization that oversees assassins and ranks them. Starting at Rank 11, Travis works his way up to being the best in the world. Filled with unique bosses and some plot twists near the end, the story is decent, if not over the top. In fact, the story is what probably will keep most gamers playing as the gameplay becomes repetitive. No More Heroes plays in a third-person perspective. The general flow of the game goes as follows: sign up for side job (catchings cats, mowing grass, collecting scorpions, etc), complete jobs for enough money, deposit money at ATM, go to mission point, complete mission, repeat ten more times. The flow of the game is fine at first, but once you get about a third of the way, you start to realize just how repetitive the game becomes. Once in a mission, you guide Travis to the boss through the "level". Along the way, there will be hoards of enemies in your path, some with fighting with their fists, some with pistols and assault rifles, and others with their own beam katanas. This is where the meat of the game is. Combat involves utilizing your beam katana in a high or low position, based on how you're angling the Wiimote. One would expect to be swinging the Wiimote around to slash with the katana, but instead that is regulated to a simple press of the A button. This actually works out fine as swinging around with the katana would become very tiresome. In addition to beating enemies down with the katana, on-screen arrows will indicate deathblows to finish enemies off. Once you've beaten an enemy to near death, an arrow (example: pointing left) will appear, signaling the player to gesture the Wiimote in that direction, delivering the finishing blow. Travis can also perform wrestling moves (after learning them by watching wrestling tapes found at the video store in Santa Destroy). These are started with the grab button (B) and then a gesture indicated on-screen for both the Nunchuck and Wiimote. This makes up the general combat of the game and what the majority of the game will be about. The level designs are nothing special, as the main point is to make it from point A to point B. However, level design becomes non-existent halfway through the game. Without spoiling too much, one level just consisted of running down this endless hallway, killing enemies throughout, before getting to the boss. I was completely stunned by that particular level. The best gameplay aspect are the boss fights. With 10 or so bosses (based on the 10 assassins ranked better than Travis), each one is unique in both personality and combat. You have a magician who uses his tricks to try to kill you, a super villian decked out in costume and powers, a girl who seems so sweet but has a bat ready to your head, and more. You are forced to learn patterns in order to defeat each boss. The boss battles are what makes the game worth playing. Everything inbetween such as running around Santa Destroy, doing side jobs, and the levels leading up the bosses are just filler. The game utilizes a cel-shaded style similar to Suda51's Killer 7. 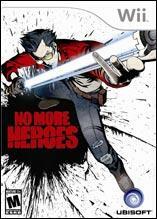 It gives off a unique look for such an interesting game such as No More Heroes. Frankly, it works, but there's nothing jaw-dropping about the visuals. When decapitating enemies, fountains of blood literally pore out everywhere. Some textures become blurry when zoomed in on. Don't expect grass to blow realistically with wind like you might find on the PS3. Most of the levels in the game utilize the same track. However, each boss fight usually has a unique battle theme. There is nothing too special about the soundtrack, but it works effectively with it's mix of elevator-like music, retro style sound effects, and techno-ish beat. This is where No More Heroes hits big. Each character in the game (especially the prominent ones such as Travis and Sylvia) are unique and backed with an over-the-top voice actor to make them see that much more ridiculous and comic book-like. Throw in the cel-shaded graphics and music and you have a package that has Suda51 written all over it. While the gameplay itself leaves much more to be desired, the combination of everything will make gamers want to finish the game to see how things play out. Besides the main game, side quests include collecting wrestling trading cards (5 per level for a total of 50 for the game) which really aren't that difficult to find as you usually won't miss them, getting better rankings on side jobs and assassination missions, and finding over 100 different t-shirts which are usually located in dumpsters). Also, in order to see the "real" ending, the player must purchase all the beam katanas from the weapons store. There isn't much else besides that. This isn't like Grand Theft Auto where you can have fun screwing around in the city as Santa Destroy isn't much of one. Much like Uncharted, I think most gamers will be satisfied upon completion of the game and the resolution of the plot.